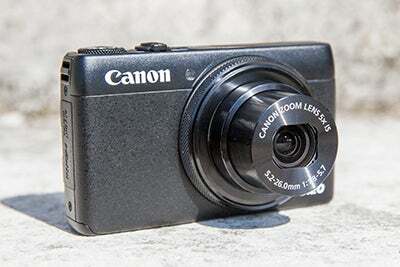 Canon has strengthened its PowerShot series of compacts by announcing the Canon PowerShot S120. Successor to the S110, this latest model shares many of its features with Canon’s larger PowerShot compact – the Canon PowerShot G16. Built to be faster and more responsive than previous PowerShot S-Series cameras, the S120 features the new DIGIC 6 image processor that’s teamed alongside a 12.1MP 1/1.7in high-sensitivity CMOS sensor. With an ISO ceiling of 12,800, it’s capable of shooting at a breathtaking 9.4fps, which is 0.1fps faster than the burst rate offered by the PowerShot G16. The SX120 is claimed to be the world’s slimmest camera to feature an f/1.8 lens that’s equivalent to 24mm at the wide end of the focal length. Speed improvements have not only been made to continuous shooting – the speed of the S120’s autofocus performance is supposedly 50% quicker than its predecessor. Just like the PowerShot G16, the Canon PowerShot S120 provides full manual control of important exposure settings, while also offering Raw support for photographers who’d like to take maximum control in post-processing. Full HD (1920×1080) 60p movie recording is another new feature that’s not been seen before on a S-Series model, and in keeping with the company’s push to make all of their products better connected, Wi-fi functionality is available to post images to social media or via portable devices. 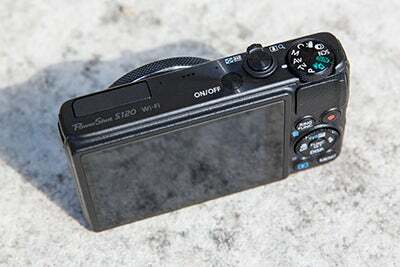 The Canon PowerShot S120 features a touchscreen at the rear. 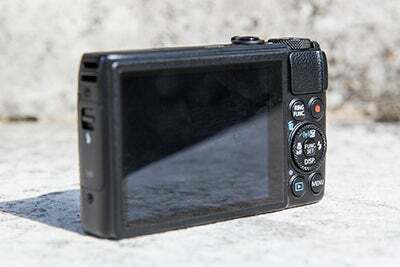 One of the key differences between the PowerShot S120 and the PowerShot G16 is the screen. Unlike the G16’s 3in display that’s not the touch-type, the S120’s is and allows users to navigate the camera menu by touch or alternatively use the dedicated control buttons. Those who have an interest in astronomy photography will appreciate the new Star mode that features three settings – Star Nightscape, Star Trials and Star Time lapse movie. Designed to make it easier for beginners and novices to shoot star trails and starry skies, the creative filter is entirely automated much like the new Background Defocus mode that takes two shots in quick succession before identifying the subject in the image and merging it with a blurred background. Full manual control of exposure settings can be taken from the mode dial on the corner of the body. Designed to be pocket size with a better premium finish than its predecessor, the PowerShot S120 also uses Canon’s renowned Optical Image Stabilizer technology to counteract for hand shake. For video there’s also a five-axis enhanced dynamic IS mode to reduce the rolling motion-style shake that’s typically associated with movies taken when walking. Canon expects the PowerShot SX120 to be available from late September or early October. It’ll cost £449 – £100 cheaper than the PowerShot G16.